Obtaining insurance for your car, home, or healthcare is something everyone must do at some point. During this process, we supply insurance producers with our most sensitive information and trust them to use it appropriately. But in this age of identity theft and insurance fraud, how do you know if the person handling your information can be trusted? The fact is that depending on the state, your insurance provider may or may not be required to undergo a fingerprinting and thorough background check before receiving an insurance license. This can lead to loopholes for criminals to access valuable information. As a consumer, it’s important to know the requirements for your state before handing over important personal information to be sure that it doesn’t fall into the hands of a convicted criminal. Fingerprinting as a part of the background checking process provides much more comprehensive information than other methods because fingerprints can be scanned against the FBI’s Criminal Database to reveal a criminal history that may have otherwise been missed. According to an Insurance Journal survey, states that require fingerprinting find that it makes a significant difference, reporting that fingerprinting has helped them identify potential insurance producers (also referred to as insurance brokers or agents) who have had run-ins with the law or have served prison time. Some states rely in part on background questions in licensing applications, but a convicted felon may not be inclined to divulge past crimes and misdemeanors or may have forgotten about past records, felt that the offenses were too minor to report, or even assumed convictions were removed from or “dropped off” their personal records after a number of years. Whatever the case, this is not a reliable source of information. States that enforce more stringent background checks report finding all kinds of misdemeanors and other crimes that have gone unreported by applicants. Matt Ray, deputy commissioner for the Texas Insurance Department at the time of this survey, stated that an average of 30% of applicants answer background questions incorrectly and fail to disclose their criminal history. He also noted that even if all questions were answered accurately, state and national fingerprint criminal history reports allow those reviewing them to see necessary details about the scope and nature of crimes committed. In a Government Accountability Office report, California officials disclosed to federal researchers that criminals convicted of drug possession, forgery, DUI, grand theft, battery, and other crimes have been blocked from obtaining licenses due to fingerprinting as a part of the background check process. Not only does fingerprinting reveal important criminal information, it also acts as a deterrent for those thinking of preying on trusting consumers. Each state has its own insurance agent licensing requirements, which can include background checks with or without fingerprinting, pre-exam training, and exam passage. Today we are focusing on the level of background checking (or lack thereof) for each state. You can learn more about each state’s insurance licensing requirements here. Alabama, Alaska, Arizona (for initial license), California, Florida (most types), Georgia, Hawaii, Idaho, Louisiana, Minnesota, Montana, Nevada, New Jersey, New York (most types), North Carolina, Ohio, Oregon, Pennsylvania, Tennessee, Texas, Utah, Washington, West Virginia, Wisconsin, and Wyoming (for initial license). Arkansas, Delaware, District of Columbia, Illinois, Iowa, Kentucky, Maine, Maryland, Massachusetts, Michigan, Mississippi, Missouri, New Mexico, North Dakota, Rhode Island, South Carolina, South Dakota, and Virginia. Colorado, Connecticut, Indiana, Kansas, Nebraska, New Hampshire, Oklahoma, and Vermont. If you are in one of these states, it is especially important to fully vet your insurance agent using the tips below. Regardless of the insurance provider requirements in your state, there are steps you can take to find the best, most reputable insurers and avoid becoming a victim of insurance fraud or related crimes. Check insurance companies and look for “A” ratings with M. Best, Fitch, Moody’s, and Standard & Poor’s to indicate financial strength and creditworthiness. Read social media and local directory reviews to hear what others have to say about the practices of insurers in your specific area. Ask friends, family members, and others in the community what agents they would suggest based on personal experience. If you are in a state that doesn’t require thorough background checks, ask insurance providers what their specific screening process is for insurance producers they hire. For individual agents, ask for references and proof of licensing in your state. You can also use the NAIC Consumer Information Source webpage to vet insurance agents and companies. Check your state’s insurance department to evaluate potential insurance agents. Click here to find information for your specific state. Fingerprinting services are mandatory for the purposes of background checks. 20 hours of pre-exam training are required for each line of authority: property, health, life, casualty, and personal insurance. Passage of each exam (for relevant insurance lines of authority) are required prior to applying for a license. To get the most up-to-date information on insurance agent licensing requirements for Nevada, click here. Many state licensure programs now require fingerprint background checks for the benefit of both the applicant and the people they will serve. Fingerprinting Express offers friendly, affordable fingerprint background checks and FBI background checks in compliance with state requirements. You will need to present a valid government-issued photo ID at the time of fingerprinting. Passports and international IDs are also acceptable if they are valid and provide identifiable information. 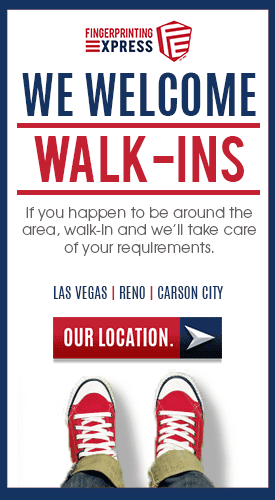 As your trusted source for fingerprinting and background checks in Nevada, we offer convenient, walk-in service at all of our Nevada locations! Learn more about our fingerprinting services here or give us a call with any questions. Searching for a reliable fingerprinting and background check solution? Look no further than Fingerprinting Express! We are here to provide fingerprint and background checks to professionals and individuals in Nevada. Visit any Fingerprinting Express location to get support with your background checks and fingerprint requirements!